Streamside Pro Staff; Hammond River Angling Association Vice President. If you're too busy to go fishing, you're too busy! Like last year, on the first day (the 16th) camp set-up will take place, followed by the bar-b-cue and captain's meeting. The social with live entertainment will follow. Bright and early the following morning, fishing will begin at 6am and will resume at 4pm with "weigh-in" and awards ceremony. To sign-up for the tourney, as well as additional information (maps, directions, etc), please visit http://xkfx.ca/2011_cka_cross_canada_tour/hammond_river_classic . I can't wait man! Last year was awesome! Good news! the event might be covered by CTV! Long story: I just got interviewed by CTV News about fundraising $100k for the Search & Rescue organization I'm with, and the interviewer (Mr.Mike Cameron) noticed my CKA sticker on my truck and we started talking about kayak fishing off camera. He said he'd like to cover the tourney. Yee-ha! By the way, we sure could use your support! Just go to this site: http://www.refresheverything.ca/lostwithoutyou and vote for us! Thats great JC! Keep us posted on that stuff! Just to reiterate, the Hammond River Classic is a species tournament, which means the winners will have caught the most individual species of fish. This makes for an interesting tournament as anglers who are proficient at catching a few species don't necessarily know how to catch ALL available species, and therefore must hone their lesser skills to compete. It makes for an even playing field for everybody. In the event of a tie, total fish lenght will be the tie-breaker. But beware: If Jeff has a 5 foot sturgeon and a 19 inch smallie, and Dave has an 8" yellow perch, a 9" white perch, and an 8" pumpkinseed, he beats Jeff. So don't go spending most of your day trying for the long fish like sturgeon and the eels. Concentrate on numbers, not lenght. Again this year, a garbage bag of trash picked-up during your day along the river bank will count as a fish species. You still have two months, folks! Better do your homework and figure out how to catch the most variety on this list! Garbage pickup along the river is always fun! Good thing it's catch and release.. otherwise, where would I put my fish??! good on ya for picking up the trash though!! The HRAA and the community thought that was such a good idea last year, that they requested we do it again this year. Everybody had a lot of fun with that, too. So, since this IS in tidal... are we good for multiple lines in the water simultaneously as we were ok for in the NB Paddlers Derby? I don't think that question came up last year. Yes, multiple lines are allowed. Not like fishing multiple lines is easy mind you... esp if the darn bottom feeders are hitting like they were at NB Paddlers derby! What I was doing was trolling with a top water for shad/white perch and a deep water for stripers. Also, while anchored I had one line at the bottom with a worm ball, while I was casting for bass and such. I wouldn't have had two lines on the bottom at the same time, as you're asking for trouble the way the catfish were hitting! I'm all paid up for the derby folks, you're stuck with me now. Anyone want to fill me in on where all the fish are? 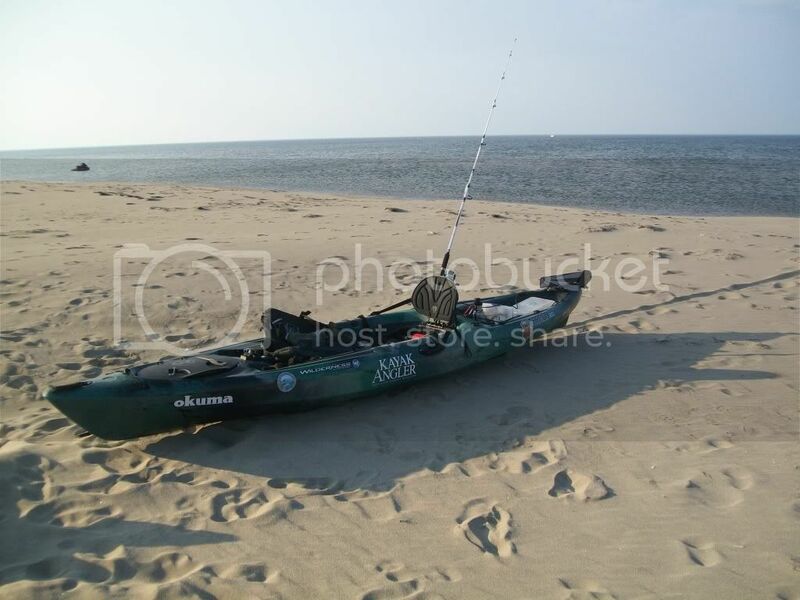 Hobie Outback 'Hank Parker Fishing Edition"
Ryan, check out the hotspot map on the website. That's just a general idea, as there's fish quite litterally all over the place there. The trick is to use your expertise to find where what specific fish you're after are: i.e.- river junctions for big bottom feeders like sturgeon, eels, catfish, etc; piers or other structure for panfish, perch, etc. ; fallen trees, big rocks for smallies; weedlines for pickerel; channels and deep holes for stripers; connecting inlets for white perch, fallfish, etc,; and the list goes on! I'm hearing reports that shad are still in the area, and a friend of mine caught a SMELT on a fly this week!